The ramus is exceptionally wide! It is comparable to other similar wide rami among Middle Pleistocene specimens such as Arago 2, KNM-BK 67, Loyangalani 1, Mauer 1 and Tighenif 3. Among later Pleistocene human remains, only Dar-es-Soltane 5 and Nazlet Khater 2 from northern Africa have a comparable ramus. The ramus breadth indicates, by extension, a long temporal fossa and anterior positioning of the zygomatic bone. This pattern appears among African later archaic and early modern humans, although present among Middle Pleistocene specimens. Distal molar megadontia: the molars become progressively larger distally with exceptionally large third molars. The combination of large molar dimensions and the proportions along the tooth row align Oase-1 with both the neandertals and some preceding Middle Pleistocene specimens (Krapina 53 -large M2-, BOU-VP-16/1 and Irhoud 3 – large M1) and Early Pleistocene specimens (KNM-BK 8518 – large M3). 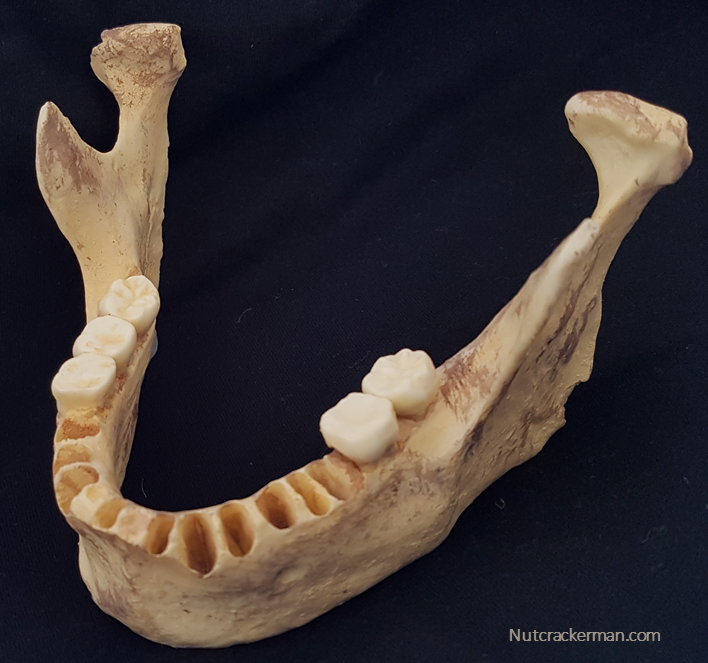 The mandible length and the cross-sectional symphyseal orientation are intermediate between late archaic and early modern humans. 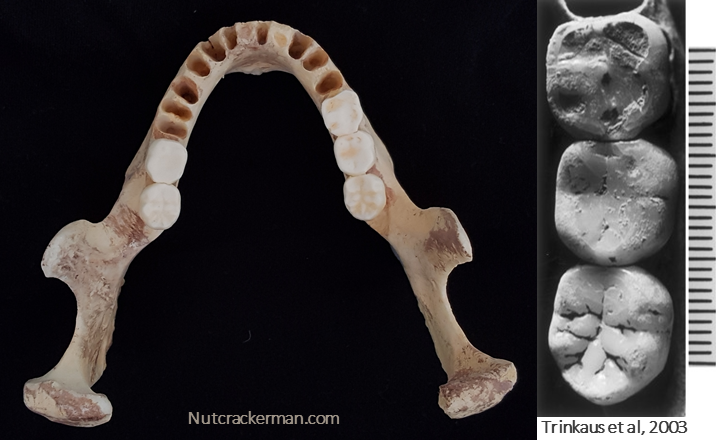 The lingual bridging of the mandibular foramen is a characteristic feature of the late Middle and Late Pleistocene members of the neandertal lineage. Moreover, in Oase-1 it is absent from the right ramus but present on the left one, as happens in half of the neandertal mandibles. The analysis shows that an amazing 6 to 9% of the Oase-1 individual genome was derived from neandertals, more than any other modern human sequenced to date. The normal neandertal contribution is 1 to 3% of the DNA of present-day people in Eurasia. The size of three chromosomal segments indicates that this individual had a neandertal ancestor as recently as four to six generations back. However, the Oase-1 individual does not share more alleles with later Europeans than with East Asians, suggesting that the Oase population did not contribute substantially to later humans in Europe. Together with other fossils recovered from the site, Oase-1 is an extraordinary case to illustrate the transition from neandertals to early modern humans in Western Europe, and the complex population dynamics of modern human dispersal into Europe. These dynamics are the result of the earlier emergence of modern humans from Africa, their dispersal over tens of millennia throughout Eurasia, and the geographically and temporally variable mixture of those dispersing populations with other regional human groups, including the neandertals and other human groups (species?) that became extinct. Esta entrada fue publicada en Fósiles y etiquetada Europa, Hybrid, Late Pleistocene, Middle Pleistocene, Neandertal. Guarda el enlace permanente. Did he speak? Probably yes. So, what was his language? Did they tell histories? did they have oral traditions? How complex was their world?